The Weekend Gourmet: Blood Orange Cake With Whipped Cream and Raspberries...and a FAB Giveaway!! Blood Orange Cake With Whipped Cream and Raspberries...and a FAB Giveaway!! I hope that you’re all having a great weekend and getting lots of holiday "to do's" crossed off your December checklist! I have some very exciting news to share: I’m teaming up with Round Pond Estate in Napa Valley to give away a bottle of their delicious sweet-tart Blood Orange Citrus Syrup and a mini bottle of their Merlot Cabernet Blend Red Wine Vinegar. Their gourmet products are wonderful, so I’m thrilled to be able to offer one of my readers a chance to try them!! 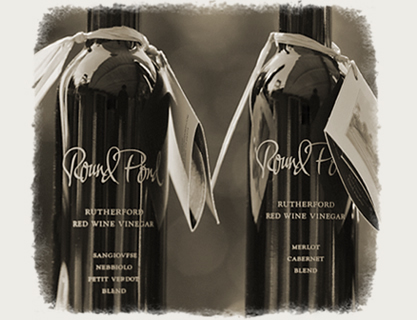 Round Pond Estate is located in picturesque Rutherford, California. It has a winery on one side of a winding country road, and an olive grove and mill on the other side. Michael and I took a belated fifth-anniversary celebration trip to San Francisco and Napa Valley in spring 2009. It was a wonderful trip, full of great food and wine!!! The most interesting tasting we took part in during that trip was at Round Pond’s olive mill. It was a delicious and educational experience! We toured the olive grove and learned how their artisinal olive oils are made. After the tour, we took part in a tasting featuring Round Pond’s olive oils, red wine vinegars, and citrus syrups. We were so impressed with the quality of their products that we brought some back home with us to use in our home kitchen! You may be wondering why a winery/olive oil mill also makes citrus syrups. I'll be happy to explain. In addition to Spanish and Italian olive oils, Round Pond makes two amazing citrus-infused olive oils: meyer lemon and blood orange. The citrus oil from the skins of the fruit are used to flavor the olive oil, but they wanted to do something with the juice that was left afterward. That’s how they came up with the idea for their delicious blood orange and meyer lemon citrus syrups. They can be used to make vinaigrettes, cocktails, desserts...you name it. You’re only limited by your imagination!! 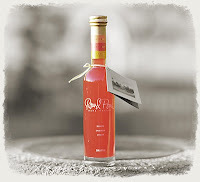 Round Pond generously sent me two bottles of the Blood Orange Citrus Syrup: one for me to cook with and feature here...and one for me to to share with a lucky reader!! The red wine vinegar was a little something extra that they sent for me to share with the winner as well. The Merlot Cabernet Blend Red Wine Vinegar that I’m giving away is made using the Orleans method. Using grapes grown at their winery, they first create a classic red wine. From there, a Mother Culture is introduced to turn the wine into vinegar. The vinegar is then aged for ten months in a French oak barrel. It's smooth and has a great depth of flavor. To enter the giveaway, leave a comment below telling me how you would use the citrus syrup if you win. For a second entry, add yourself as a follower to my blog...or tell me that you're already a follower. For a third entry, follow me on Twitter. Please make sure to use a separate comment for each of your entries...this is very important, because I’m going to go high-tech and use an online random number generator to pick the winner. You have until next Friday 10/10 to enter, and the winner will be announced next Saturday!! I used my bottle of citrus syrup to make a yummy Blood Orange Cake that I served with whipped cream and raspberries to give it some festive holiday color. We’re having family over for dinner tomorrow night, so I wanted to have a yummy dessert to share. As we’ve previously established, baking isn’t something I do all the time. When I do bake, I prefer recipes that are simple...but with a lot of flavor. This cake delivers on both counts. I found the basic recipe on Round Pond's website, but adapted it a bit to make it my own. Step 1: Preheat oven to 350. Butter and flour a bundt pan and set aside. Step 2: Add a package of yellow cake mix, 1/4 cup Round Pond Blood Orange Citrus Syrup, 3 eggs, 1/2 cup 2% Greek yogurt (or sour cream), 2 tbs. Grand Marnier, 1/2 cup water, and the zest of an orange to a mixing bowl Beat on medium for approximately two minutes. Step 3: Spoon the batter into the prepared bundt pan. Bake for 45-50 minutes, until a toothpick inserted comes out clean. When the cake comes out of the oven, poke holes on top with a wooden skewer (or fork). Spoon 1/2 cup of the blood orange syrup over the top...go slow and give it time to sink in. Step 4: Let the cake cool for about 10 minutes. Invert onto a serving platter and continue to cool. Make a glaze by combining 1 cup powdered sugar with enough orange juice to get the consistency you want. I didn’t measure, but I used the juice of a small satsuma. You can use Grand Marnier instead of orange juice if you prefer. Spoon the glaze on top of the cake and cool completely. Step 5: Before serving, pour a small container of fresh raspberries in the center well of the cake. Cut the cake into slices and add some whipped cream and a few of the berries to each slice of cake. This cake is very moist and bursting with citrus flavor. I love the flavor combination of raspberries and orange!! You can also make your own orange simple syrup. You’ll need one cup total for the recipe. Simply combine 1 1/3 cup orange juice and 1 cup sugar...bring to a boil and reduce to 1 cup. That’s it! I would love to win this.....oh the things I could make...like your cake! Well, first off, I would make this cake! Does this not look and sound AMAZING? And then, I would probably try to create my own baking concoction. Thank you for sharing this giveaway with us! I hope you have a wonderful Sunday! Wow! This cake sounds so good! I love anything with blood orange, and this cake would not disappoint, I'm sure! WOW!!!!! Looks soooooo amazing! Okay, you have me craving dessert now and I haven't even had breakfast! I will definitely be making this cake (or a reasonable facsimile). I hadn't heard of Round Pond before and they sound amazing! Right up my alley! Thanks for sharing all the great info, photos and recipe! ohhh....i would make this cake!! YUM! This looks divine. Love the shiny glaze. I would try to make a few dressings with the syrup. I haven't cooked much with syrup, so it would be a fun experiment. @SaucyDipper is following you on Twitter, too! Wow, what a lovely cake. A very creative way to incorporate the syrup! I would love to try the syrup with a yogurt and fruit-based dessert I have in mind. Thanks for sharing the giveaway! This cake sounds wonderful, perfect for the holidays! I'm not sure what I'd do with the syrup, but I'd love to have a bottle to experiment with! This is the second blood orange recipes I read. Just got to learn about blood orange. Yours looks so inviting. Thanks for sharing. And no, still got lots on my "To Do" list.. it's all good though, they're all fun things to do! I think I'd have to try that cake of yours or something like it! Absolutely delicious.. I'm dying to know how it tasted! Mind sending me a slice?? ooh, this is awesome! 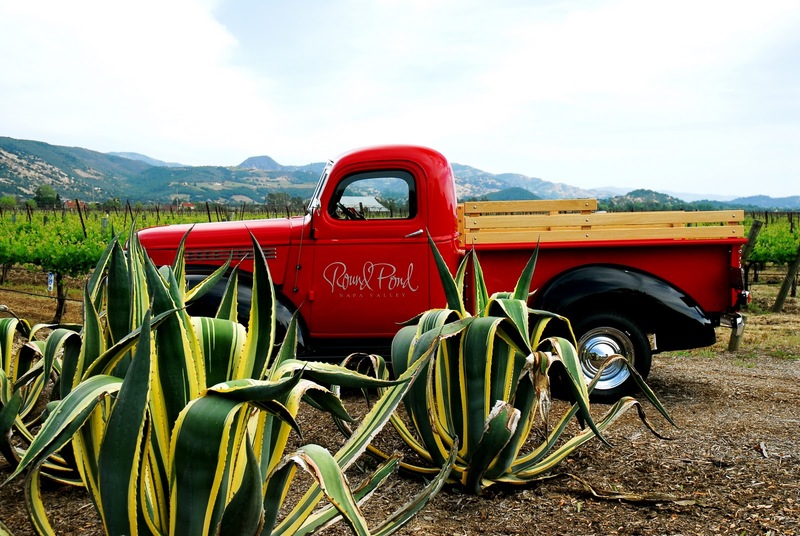 i actually went to round pond estate a few years ago + did the olive oil tasting - such a blast. if i won the giveaway, i think i'd concoct a blood orange champagne cocktail - perfect for the holiday season! I would use it to make a delicious vinaigrette for salads. & that cake!!! Ooooo...I'd use the citrus syrup in my Texas Martini margaritas. It would add a sweet orange punch to my zesty, salty limey margaritas. And I'd use the syrup and vinegar in combination for a salad dress - either for a great green salad or a rice or quinoa salad. I hope I win! the moment I read blood orange in the title I knew I'd love it. The cake is delicious. Thanks for sharing it with us. Your cake looks and sounds amazing. Wish I had a slice right now. Round Pond wine is divine along with their olive oil - one of my favorites! Whoa, that is a beautiful cake, Wendy! Awesome giveaway, too. YUMMMMM that cake looks so delicious and moist! yummy!! I would make YOUR recipe...or use my Mock Baba cake that has an orange glaze and instead use the syrup as a glaze. i would love to use it to make muffins I saw on foodgawker! mmm! Wendy-Your bundt cake is not only beautiful but so yummy with the blood orange flavor, and topped off with the heavenly syrup. BTW-I tagged you, so check it out on my blog! The cake looks amazing! What a great use of our products! Thanks Wendy and glad you enjoyed using them! I love blood oranges. This cake looks so delicious! I would use it to make a vinaigrette and something with fresh fruit. Thanks for the great giveaway! Oooh, what would I do with that citrus syrup? Hmmm...I'd love to play around with some sort of iced tea or perhaps a coffee flavoring. Oh goodness, with the way my hubs loves orange desserts, I'd made orange bars and drizzle it in a sauce over the top. Or cake. Or cupcakes. Or orange cranberry anything. He'd eat it. Also, I would definitely use this to make some light citrus mousse or reduce it down and make a sauce for chicken! Would love to win this!